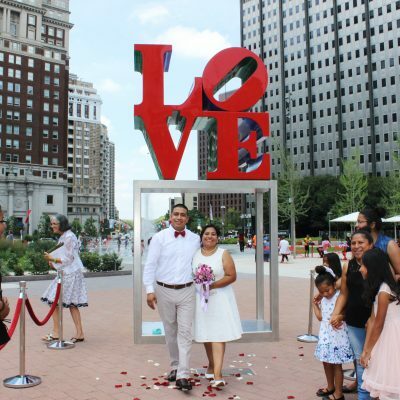 Wedding Wednesdays at LOVE Park is back for very special winter event on Wednesday, February 13, 2019! Who: Three lucky couples will be married by special guest officiants! Register to marry. Make sure to bring the proper fee and documents. Visit the Register of Wills website for more information. Contact Erin Nardini at Fairmount Park Conservancy (enardini@myphillypark.org or 215-988-9334) to reserve a 30-minute slot for Wednesday, February 13, 2019. Pay the $50 fee online through Fairmount Park Conservancy up to one day before your ceremony, OR bring a money order to the ceremony. Arrive 30 minutes in advance of your ceremony. Say “I do,” and let us do the rest. Please contact Erin Nardini at Fairmount Park Conservancy (enardini@myphillypark.org or 215-988-9334) for more information.